Almost nothing is known about the early years and training of Domenico Veneziano, an enigmatic artist of the first half of the 15th century but one of the most important Florentine Renaissance painters. It is assumed that he arrived from Venice, where he may have been born. The first documentary reference to him is a letter by the artist to Piero de’Medici written in Perugia in 1483 and requesting work. The following year the name of Domenico Veneziano appears in another document in which Piero della Francesca is referred to as his assistant and in which he is recorded as being paid for a (lost) fresco painted for the Florentine church of Sant’Egidio. There are few documented works by Domenico Veneziano, among them the Carnesecchi Madonna in the National Gallery, London, which is considered an early work, and the Saint Lucy Altarpiece, the central panel of which is in the Uffizi in Florence while its predella panels are in various collections. This Monk holding a Cross was in a private Italian collection. It entered the Thyssen-Bornemisza collection prior to 1930 and was included in the 1930 Munich exhibition at the Neue Pinakothek. In an article published that year it was attributed by Raimond van Marle to Veneziano, and Marle suggested that the monk might be a Saint Francis or a Saint Dominic. Marle compared this monk with the figure of Saint Francis in the Uffizi panel.Marle’s attribution was shared by other authors such as Suida and Berenson. Pudelko, however, mentioned the idea that it was by an anonymous artist familiar with central Italian art and Laura Bertacchi later included the painting within the work of Pietro Ispano in her study on the polyptych in Santa Maria di Bressanoro. With regard to the identification of the saint, in addition to van Marle’s suggestion, other ideas have included Saint Philip Benizzi, patron saint of Florence, the city where he was born and where he was a member of the Servite Order. Philip Benizzi is normally depicted with a crucifix and a lily, wearing a papal tiara and dressed in the habit of his order. 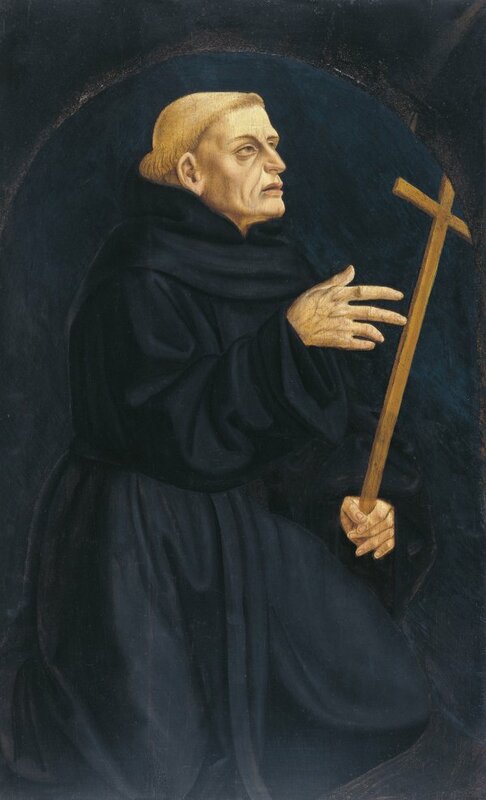 This panel was restored prior to the Munich exhibition of 1930, at which point a series of retouchings that had transformed the monk into Saint Philip Benizzi were removed. The figure had a halo and was holding a bunch of lilies together with the cross, to which a figure of Christ had been added. In addition, a heart had been painted on the Saint’s breast. The panel depicts a figure of forceful personality whose hands, face and even the folds of the habit express an emotional charge that Veneziano has conveyed with a great sense of three-dimensionality and visual power. The panel has been dated to around 1445 48.